Little Sis LOVES to count; she loves to tell me how old she is, how old baby brother is, and that I need to read 3 more books at night because she is not going to bed yet! 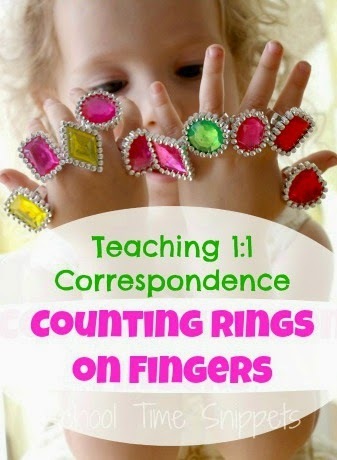 And so I came up with an idea to work on 1:1 Correspondence, but it also happened to reinforce shapes and color matching skills, too-- Rings On Fingers Counting Activity. The only thing you need for this activity is a package of cheap ring s. I purchased a bag of 18 from Party City. I placed them in a tray and invited Little Sis to come over to the table with me and explore. 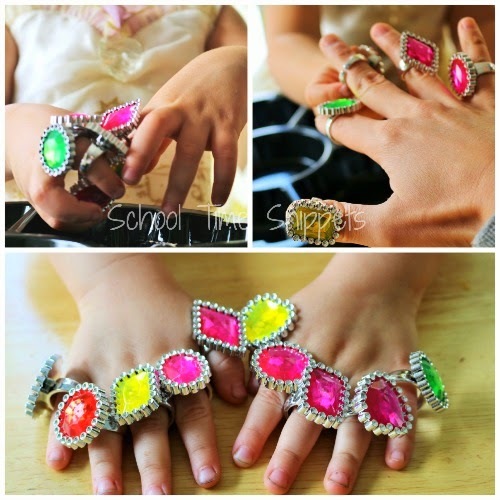 And since she loves all things "sparkly," she loved this simple preschool math activity. 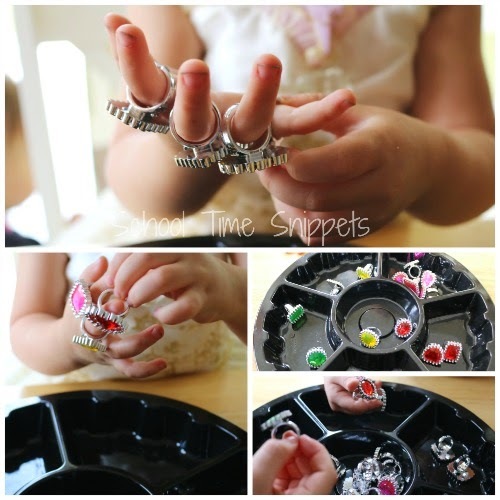 I initially set it out for her to sort through the shapes first, but she immediately began doing what I had originally planned for the activity; she began putting one ring on each finger. I tried getting her to sort shapes and colors later, but she still didn't go for it. However, we did count A LOT! We counted as she put a ring on each finger, which reinforces 1:1 Correspondence. We counted as she took them off her fingers. I even introduced simple story problems!